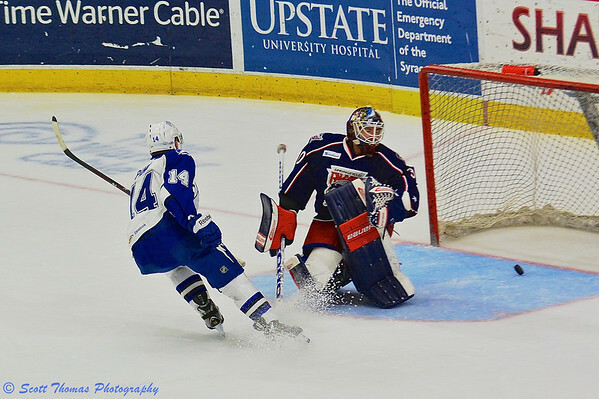 Syracuse Crunch Richard Panik (14) beats Springfield Falcons goalie Curtis McElhinney (30) for the Syracuse Crunch’s first goal in American Hockey League (AHL) Calder Cup Playoff action at the Onondaga County War Memorial on Wednesday, May 15, 2013. Syracuse went on to win the game 3-0. Nikon D7100/70-200VR, 1/800s, f/4, ISO 720, EV +1.3, 110mm focal length (165mm DX). With apologies to my Massachusetts blogmates Karma and her sister, Jennifer, the Syracuse Crunch made quick work of the Springfield Falcons by sweeping the series, 4 games to 0 in the Best-of-7 AHL Eastern Conference Semi-Finals. The series got a bit chippy during Game 3 and the AHL on ice officials had their hands full until the Crunch built up a 3 goal lead. 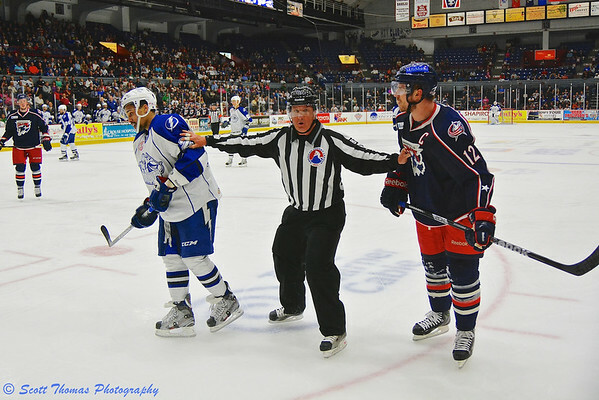 AHL Linesman separates Syracuse Crunch J. T. Brown (23) and Springfield Falcons Ryan Craig (12) in American Hockey League (AHL) Calder Cup Playoff action at the Onondaga County War Memorial on Wednesday, May 15, 2013. Nikon D7100/24-85G, 1/800s, f/3.5, ISO 1400, EV +1.3, 24mm focal length (36mm DX). The third goal was scored by Tyler Johnson (9) with an assist from Ondrej Palat (12). What I like about this Crunch team is every goal is celebrated like it was a game winner. Syracuse Crunch Ondrej Palat (12) celebrates Tyler Johnson’s (9) goal against the Springfield Falcons in American Hockey League (AHL) Calder Cup Playoff action at the Onondaga County War Memorial on Wednesday, May 15, 2013. Nikon D7100/70-200VR, 1/800s, f/4, ISO 1000, EV +1.0, 190mm focal length (285mm DX). Game 4 was preceded by a party thrown by the City of Syracuse and the County of Onondaga which got the fans of over 5,000 primed for a big night. Many brought brooms anticipating a sweep. Not one to disappoint, the Crunch took a two goal lead on this speed play by rookie Vladislav Namestnikov (18) which set up a tip in goal by Mark Barberio (not shown). 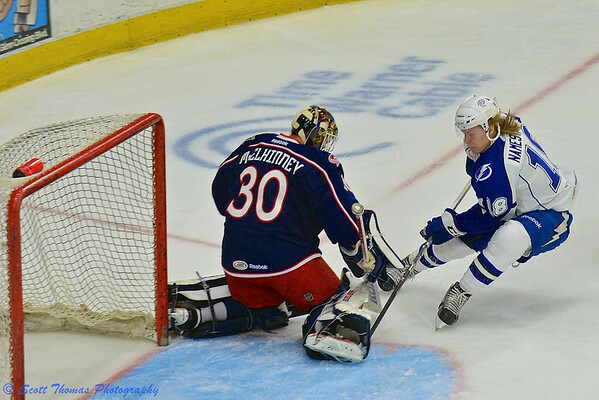 Syracuse Crunch Vladislav Namestnikov (18) tries to stuff the puck past Springfield Falcons goalie Curtis McElhinney (30) in American Hockey League (AHL) Calder Cup Playoff action at the Onondaga County War Memorial on Friday, May 17, 2013. Nikon D7100/70-200VR, 1/800s, f/4, ISO 1250, EV +1.3, 130mm focal length (195mm DX). Crunch goaltending remained in good hands as Cedrick Desjardins (30) only allowed 7 goals over the 4 games with one shutout. 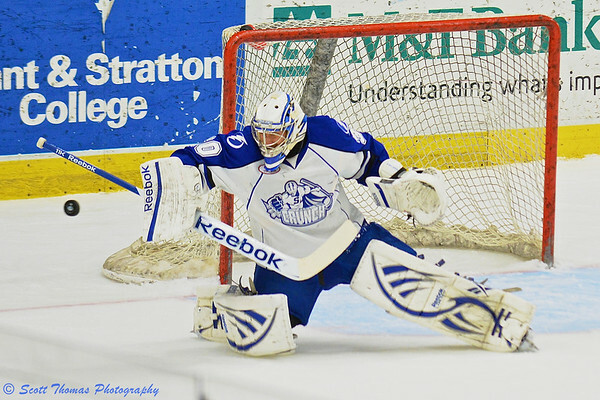 Syracuse Crunch goalie Cedrick Desjardins (30) makes a blocker save against the Springfield Falcons in American Hockey League (AHL) Calder Cup Playoff action at the Onondaga County War Memorial on Friday, May 17, 2013. Nikon D7100/70-200VR, 1/800s, f/4, ISO 2000, EV +1.3, 200mm focal length (300mm DX). Hockey sportsmanship has the teams lining up for the traditional handshake at the end of a series. After many hard fought games, the players shake hands in mutual respect. 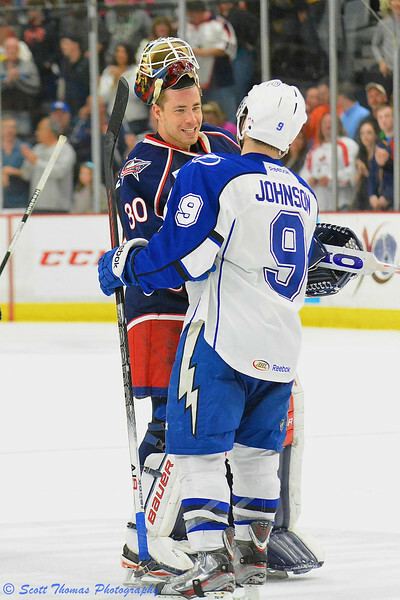 Syracuse Crunch Tyler Johnson (9) shakes Springfield Falcons goalie Curtis McElhinney’s (30) hand after defeating the Falcons in an American Hockey League (AHL) Calder Cup Playoff series at the Onondaga County War Memorial on Friday, May 17, 2013. Nikon D7100/70-200VR, 1/800s, f/4, ISO 3200, EV +1.3, 102mm focal length (153mm DX). J. T. Wyman (15) scored two goals in the series clinching win and was named First Star of the game. That got him an interview on Time Warner Cable Sports television after the game. 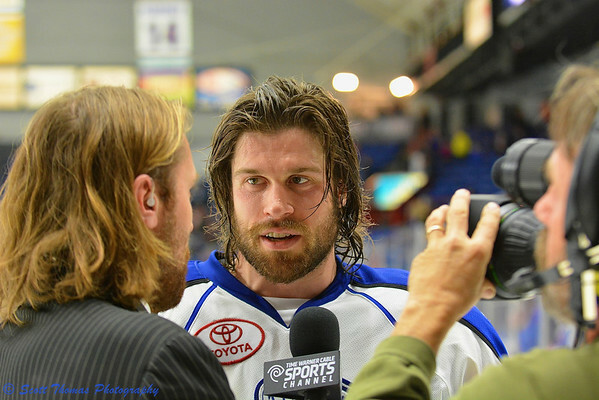 Syracuse Crunch J. T. Wyman (15) being interviewed by Eric Neilson on Time Warner Cable Sports after defeating the Springfield Falcons in American Hockey League (AHL) Calder Cup Playoff series at the Onondaga County War Memorial on Friday, May 17, 2013. Nikon D7100/70-200VR, 1/1250s, f/4, ISO 2200, EV 0, 70mm focal length (105mm DX). The Crunch are still waiting for their next round opponent. This entry was posted in Sports, Weekly View and tagged 24-85mm, 70-200mm, ahl, american hockey league, calder cup, crunch, falcons, hockey, ice, new york, nikon D700, players, playoffs, springfield, syracuse, time warner cable sports, twcs, vr. Bookmark the permalink. LOL, but it looks like our home team has the jump on yours for the big show! Game 3 tonight, right? Boston (my Mom’s team) is looking good after easily dispatching the NY Rangers (my Dad’s team) and went into to Pittsburgh to bring back a 2-0 lead back to the Garden. Alas, Montreal (my team) ran out of players and luck against the Senators.